The memories people keep are vast and varied but most people have at least some memories that involve food. Even most of the greatest chefs of our time will remember, are inspired by, and mention his or her “momma’s cooking” and the memories it induces. Breaking bread with someone is one of the most civil acts we, as a species, can participate in to express our humanity toward one another and breaking bread with family is one of the most special and loving acts we commit in our lives. With that being said, we all have different tastes; some like simple cuisine while others enjoy more complex dishes, and even within our own family, our tastes clash and mirror our lives away from the dinner table. 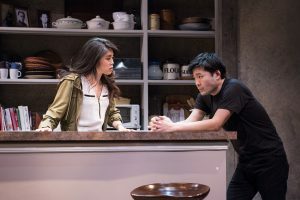 In Everyman Theatre’s latest offering, Aubergine by Julia Cho (in association with Olney Theatre Center), Directed by Vincent M. Lancisi, gives us a glimpse into the lives of an Asian-American family in the last days of the father and how even in the most strained and estranged relationships, there’s hope for a reconciliation or redemption when we take the time to learn about one another and see each other from a different angle. 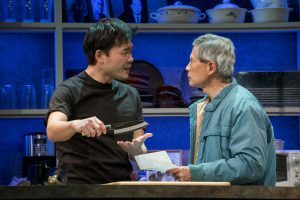 Briefly, Aubergine follows the story of Ray, a young Asian-American chef, as he processes the passing and last few days of his father, with whom he’s had a strained and volatile relationship with for most of his life. The father, is a stern, simple man who doesn’t seem to appreciate the more stylish, complex life Ray has chosen to live. 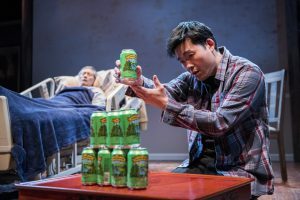 When Ray is called to care of his dying father, he reconnects with a jilted lover, Cornelia, who still has strong feelings for Ray, and his estranged Uncle from Korea. Together, through a language and cultural barrier and food, they learn to process the passing of this man they knew at different times and realize the lessons he’s taught them through his actions. Technically, Everyman Theatre has not disappointed thus far and Aubergine is no different. Set Design by Misha Kachman is intelligent and appropriate using a unit set that can be used to portray different locations using set pieces that are easily set up and taken away, not interrupting the flow of the piece. The modern setting is authentic and adds value to the piece as a whole. Along with Kachman’s Set Design, Light Design by Harold F. Burgess II and Sound Design by Roc Lee work in tandem to help tell and move this story along. With isolated lighting on various sections of the stage at certain times, Burgess manages to set the mood for each scene beautifully while Roc matches the mood with traditional and modern music, as well as impeccable sound effects to represent certain locations. Overall, Kachman, Burgess, and Lee should be applauded and commended for their efforts in this production. Vincent M. Lancisi, Founding Artistic Manager of Everyman Theatre, takes the helm of this piece and presents it simply with a clear vision. His staging is superb as the pacing is consistent which moves the story along nicely. This is a tricky subject matter that should be handled with kid gloves, and Lancisi has managed to present it respectfully and with due diligence, but truthfully, as well. 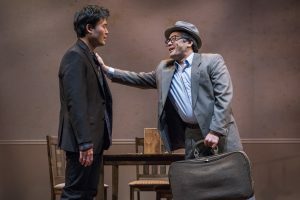 His decision to use subtitles is wise as a lot of this dialogue is in Korean and this helps the audience keep up without sacrificing the tempo of the piece. His casting is splendid and his cast comes together as naturally as any real family going through this type of situation. It’s clear that Lancisi has a firm comprehension of this delicate material. Moving on the performance aspect of this piece, Everyman Theatre Resident Company member Megan Anderson takes on the supporting role of Diane and Hospital Worker and though her stage time is light, she makes the most of it, starting off the show with the first of a few monologues, setting the tone nicely and setting the stage for the piece as a whole. Jerfferson A. Russell takes on the role of Lucien, the hospice nurse assigned to Ray’s father. Russell shines in this role and he seems to completely embody this special type of character who must have a perilous balance of compassion and logic dealing with death and the family members left behind. Russell has a great presence and understands his character and his part in the hospice process, making for a confident and authentic performance. The son, Ray, has an unlikely support system in this story and Eunice Bae tackles the role of Cornelia, the younger, but just as mature girlfriend and Song Kim takes on the role of Uncle, the brother of Ray’s father who is almost a stranger to Ray, but understands the value of family and travels far to be with him. Both of these actors are standouts in this production. Bae is outstanding in this bi-lingual role and she really grasps the meaning of her character. She plays the character with a natural flare that fits it nicely. Bae understands that this character is kind of the caregiver for the caregiver and, though she is not obligated to take on such responsibility, steps up and does so. Her comprehension of the character is clear and she is comfortable in the role, playing her confidently. Kim, too, is impressive in his role which requires speaking Korean more than English (having only a few lines or words in English), he manages to play this character in a way we can understand exactly what he is saying (even though there are clear subtitles). This really displays his aptitude as an actor knowing how to communicate non-verbally, but clearly. His chemistry with his cast mates is spot on and his comprehension of the material and his character make for an outstanding performance. Lastly, we have Glenn Kubota as Ray’s Father and Tony Nam as Ray, the two characters around whom this entire story revolves. Kubota is absolutely authentic as an immigrated Asian father (I grew up with one, I know all too well) and he hits the nail on the head in his performance. It’s like watching my own father up on the stage and it was both eerie and poignant, for just a moment, seeing my father here with me again. Though Kubota doesn’t have many lines, his performance is stellar. I admit, I may be biased, considering my life experiences, but Kubota wears this character like a perfectly fitting glove. He has a complete grasp on this character and plays it to the hilt making for an incomparable performance. The character of Ray holds a special place in my heart as well, being a character to whom I can completely and utterly relate. Growing up American with deep Asian roots can be tricky and it’s a delicate balance one must keep and Nam portrays this flawlessly. 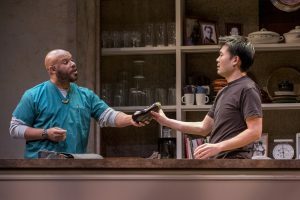 He embodies his character and emotes the conflict of resentment and love he has for his father, which many folks have, I suppose, and makes it easy for the audience to connect with and relate to him. He has a good command of the stage, a great chemistry with his cast mates, and has a deep understanding of his character making for a splendid performance. 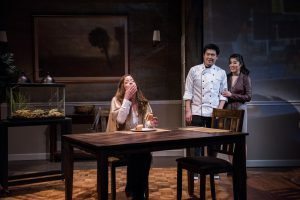 Final thought… Aubergine is a heart-wrenching look at strained family relationships and regrets in the last days of a loved one’s life, but it’s also a redemption, of sorts, with new connections and positive self-realizations. It’s an emotional roller-coaster that brings out the best and worst in family relationships, especially between fathers and sons, when they are separated not only by generation but by culture and taste. This one hit home hard for me, experiencing the passing of my own father just last June, but this piece presents the hospice process exceedingly well with poignancy as well as with a pinch of humor, giving a well-blended mix of ups and downs that make for a good drama. The performances are authentic and natural, and the characters are extremely relatable. The staging and pacing is on point making for an impeccable evening of theatre. The passing of a loved one is never easy, no matter how your relationship played out, but this piece is a great account of how things could be handled and what happens in those final days. Do yourself a favor – grab your tissues and get out to experience this show! It’s not one you want to miss this season. 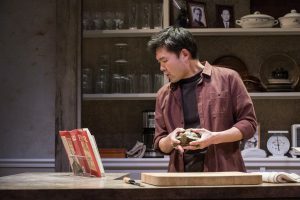 This is what I thought of Everyman Theatre’s production of Aubergine… What did you think? Please feel free to leave a comment! 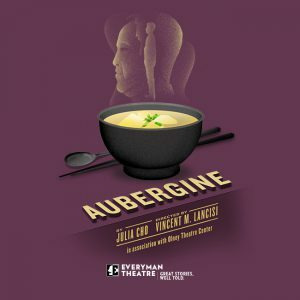 Aubergine will play through April 15 at Everyman Theatre, 315 W. Fayette Street, Baltimore, MD. For tickets, call the box office at 410-752-2208 or you can purchase them online. As an added bonus, use the online code FOODIE18 for a 20% discount on tickets!